Chris Hughton says all that matters for Albion this season is staying in the Premier League after a summer where transfer fees have escalated dramatically. The Seagulls are preparing for their first season in the top flight of English football for 34 years and so far this summer Premier League clubs have spent more than £850m. 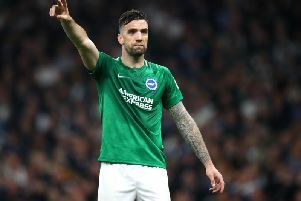 Albion entertain Manchester City in their opening game of the season and the title-challengers have spent £156m in this transfer window, while Brighton's biggest outlay has been the reported £5.2m fee for Australian goalkeeper Mathew Ryan. Looking ahead to the opening game, Hughton said: "Whatever their starting team is against our starting team, there's no doubt there's going to be an incredible massive difference. "But they're expected to win league titles and Champions Leagues and if I was in his (Pep Guardiola's) position, I'd probably be doing the same. "That's their goal and their expectation, ours is to make sure we're in the Premier League come the following season. "The way some of the big teams are spending, there are going to be massive gaps in what they can bring in and what we can. "That's something which has changed probably a little bit more this summer. The prices have escalated dramatically but come the first game of the season it will still be 11 versus 11. "One thing you always have to appreciate is wherever you are working, you've got to work within the boundaries and the finances of that football club. "City, United, Liverpool and so on can afford to do what they're doing at the moment, so good luck to them."